Once again this year the PTC is looking at using our corporate sponsorship support around the Fun Run to fund a special need at the school and featured project. Amy Chamberlain has identified an important path for our school to create future-ready InnovatED Classrooms at Cedar Mill. The attached sponsorship packet outlines all the details and includes photos of the project. The “hardware” is essentially a large flat screen TV on a cart that integrates directly with both teacher and student iPads in the classroom. It allows for all sorts of innovative and student-led learning and teaching opportunities. As a Cedar Mill School Fun Run Corporate Sponsor you will receive exposure to over 500 local families. Corporate sponsors are recognized so our school community knows the local companies who support our organization’s mission. Corporate sponsorship opportunities are not limited to current Cedar Mill School families. WHAT IS AN innovatED Classroom? Transforming a classroom to become Future Ready requires innovation and technology integration. Today’s classroom aims to engage students, promote collaboration, and inspire students to explore their natural curiosities and promote learning. This featured product seeks to transform classroom instruction by removing barriers and engaging students through collaboration, promoting ownership of student work, and adapting instructional practices to the ever changing future. With the current AV setup, classroom teachers must remain stationary at a central location to deliver instruction. The proposed AV upgrades allow teachers to circulate the classroom while delivering and facilitating instruction and classroom discourse. Students are also able to interact directly with the lesson rather than passively receiving information. 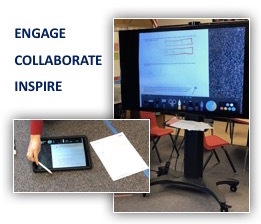 An iPad with the Apple Pencil capability serves as a document camera, while also allowing students and teachers to upload, mirror, and highlight student work. The ability to further embed multimedia and educational apps further promotes a higher rate of interactive instruction and student engagement.